An agreement between France's King Francis I and the Catholic Pope Leo X. This maintained France's catholic religion, which allowed the Pope to receive all of the catholic income in France. Also, the King had a say in who was the archbishops and other figures of the catholic church in France. Ruled for sons. Tried to be a politque, but failed because of initiating the St. Bartholomew's Day Massacre. Mob violence directed at the Huguenots in Paris. This violence led to crippling the Huguenots, because many of their leaders were killed during the massacre. Pope Gregory XIII sent the King a Golden Rose after the Massacre, so he was excited that this massacre happened. "Paris is worth a mass". Initiated the Edict of Nantes, which allowed the Protestants to have rights and liberties. He was a politique by showing welfare and a religious tolerance towards the French people. He was assassinated by a Catholic fanatic in the Queen's coronation ceremony. King Louis XIII turned the power over to Prime Minister Cardinal Richelieu. By creating the French Academy, the king and his advisor could control the education of the French Nobles. Also, Louis finished the the revolt of the feudal lords, and the nobels hated him. He was also intolerant of the Hapsburgs and Huguenots. Basically, he does nothing and Richelieu does everything. Richelieu, under Louis XIII's command, sends the French in the Thirty Years War. The reason he sent the troops into the storm was because he was afraid of France getting "pushed" around by the Holy Roman Empire and Spain. Also, the Swedes were a threat because they were after the Netherlands territory that France controlled. "By the time this is over, Frances is the strongest country in Europe". "I am the state!" King Louis XIV gained the people's respect, but he did bankrupt the state by funding the War of Spanish Succession, which France lost to Britain and Austria. Louis had control over the nobels, because he invited them to live in Versailles with him. Thus, he could watch every move of the nobels. Louis also revoked the Edict of Nantes, thus allowing the Huguenots to not have any religious and political freedom. This persecuted the protestants and controlled the Huguenots in an unruly matter. This war was fought to unite Spain and France under the Bourbon family. The two sides of the war was the Bourbon king, Philip V, and the Grand Alliance. At the end of the war, Philip V remained the king of Spain, but not of France. Thus no more Spance. King Louis XV famous mistress was Madame de Pompadour. His art style was Rococo. Believes in the separation of powers. Basically the war was Great Britain vs. the Bourbons in France. This was also called the French and Indian War. This war created huge financial problem for the French. The were embarrassed by the British troops in the war. Voltaire had a very strong view of free speech and believes that the there should be a separation of church and state. Rousseau believed that the people had the right to overthrow the government if the government was corrupt. Also, in Emile were his views on education which believed that children should be taught by themselves in nature. He was against the enlightenment because he rejected the ideas of tyranny and was an advocate for living and being one of nature. The Seven Years War, or the French and Indian War, was fought by the French and the British in America. But in Europe, the war was fought between the Hohenzollerns(Prussia) and Hapsburg (Austria). In America, the British destroy the Bourbons and claim America for themselves. In Europe, Prussia lost to Austria. King Louis XVI was an oblivious and indecisive ruler of France. His wife, Marie Antoinette, was an Austrian princess and was into the high fashions and lifestyle of the monarchs. The French called her the Austrian Dog who just sucked up the France's money of Madame Deficit. Eventually, in the French Revolution Louis and Marie were executed. Louis was charged for high treason. France helped the Americans because Louis XVI wanted to get revenge for the failure of the Seven Years War. This was a tremendous finically for the French people. Funding for the American Revolution led to a poorer France. Abbe Sieyes led the Estates General into the National Assembly in the French Revolution. Assignats was the type of currency used during the French Revolution. The Civil Constitution of the Clergy was a law passed to get rid of the Catholic Church from the French Government. The Constitution of 1791 enacted the Constitutional Monarchy which made the monarchy just a figure head instead of a ruling part of the government. The 1st French Republic was the beginning of a fallen monarchy and the new National Convention. The National Convention was the constitutional and legislative assembly of the French Revolution. During the Reign of Terror, the National Convention developed the Committee of Public Safety. The Committee protected the French people from internal rebellion and outside forces. Speaking of the Reign of Terror, the "Terror" was a block of violence in the French Revolution which led to many deaths of the French People. At the end of the Revolution was a revolt against the Reign of Terror called the Thermidorian Reaction. This led to the execution of Maximilien Robespierre and other leaders of the French Revolution. Oligarchy. This was the second to first stage of the French Revolution. The Concordat of 1801 was an agreement between the Pope and Napoleon that showed Napoleon's allegiance to the Catholic Church. The Napoleonic code showed the enlightenment because it showed equality to all citizens in the law. The Continental System was a blockade against the British Isles in the Napoleonic Wars. There were 3 parts of Napoleon's empire: 1. France with a portion of Italy 2. Countries dependent on France and ruled by Napoleon's family members or close friends 3. The allies of France who were forced into their allegiance. The Peninsular War of 1808-1812 was a conflict between France and Spain and is considered the first national wars. The Invasion of Russia was a complete failure. One should never invade Russia in the winter, ever. In the Hundred Days of Napoleon's return in 1815 was when he came back from Elba to Paris. When the battle of Waterloo occurred, the French were defeated by the British troops. King Louis XVIII was brother to the late King Louis XVI. The importance of Charter 1814 was a "Bill of Rights" for the french people. The three goals of the Congress of Vienna were 1. Balance of powers 2. Compensation for War loses 3. Legitamency of powers / monarchs. France's representative was Charles Talleyrand. At the Congress he was mistrusted and secretly negotiated with Metternich. King Charles X was a conservative because he wanted the monarchy like before the French Revolution. The July ordinances were 1. dissolve the chamber of deputies 2. decreased the number of voters 3. controlled all of the presses. The people hated this and resulted in the July revolutions. These revolutions were against Charles X. In the streets of Paris the developed barricades the people revolted. Charles ran away to England. King Louis Philippe was called the citizen King and his reign was known as the "orelean Monarchy". He is a different monarch, because he is going to work for the people. Ignored the demands of the urban worker and that caused the rebellion of 1848. In France, they had a liberal form of a republic. Only males have the right to vote. The president was Louis-Napoleon Bonapart (Napoleon III). This republic was heavily influenced by socialism. The February Revolt was against the monarchy. Provisional governments took over. The people were rioting over that the workshops closed, thus they have to go out and actually work for money. People are looking for socialism, but they got a Republic instead. Louis Blanc was an utopian socialist and he wants a national workshops. The government will provide these, but these failed because they ran out of money. The government just ended up printing money and giving it to people. The significane of Gutenberg is that he creates the printing press. This develops making books and papers more common for peasants. No longer are expensive books on the table, but cheaply made Bibles and such can be used for the common man. One of Luther's main concepts was "Salvation through faith". Which means that salvation can not be bought (reference to indulgences), but one must learn of Christ inorder to be saved. The priesthood of all believers means that a person has the right to learn for themselves about Christ and His teachings. Luther believed that people should obey their government and he was against rebellions. Charles V's nickname was "El Dorado" or "the golden one". The reason he got so much land was because his grandparents were Ferdinand II of Aragon and Isabella of Castile and his other grandparents were Emperor Maximilian I and Marie, thus he inherited Spain and the Holy Roman Empire. When he retired to the monastery, he divided his land between his son Philip II who got Spain and his brother Ferdinand I who received the Holy Roman Empire. The Diet of Worms was a collaboration of the Holy Roman Empire in order to figure out what to do with Luther. The Emperor Charles V was there and announced that Luther was guilty. Luther escaped being arrested and hid in a nearby castle and translated the New Testament into German. The peasants used Luther as a "scape-goat" to revolt. Luther responded towards the revolt by speaking against it. He believed that the peasants were acting out in anger. He could not support the revolt because it would break the peace. The Council of Trent was when the Catholic church got together and decided how to reform the church. The reason they wanted to change was because of the new dawn of the Protestants. The council was pretty successful because it was the begining for the church to realize what it means to actually be saved, and not buying it. It led them back to their "roots". In the Schmalkaldic War, Emperor Charles V was fighting the Lutheran Schmalkaldic League in the Holy Roman Empire. The war ended by Charles V acknowledging the Protestant as a religion in the Peace of Augsburg. The Peace of Augsburg said that Charles V would acknowledge the Protestant religion. Also, it showed that "Cuius regio, eius religio", wich meant "Whose realm, his religion". This meant that the rulers of the Holy Roman Empire could choose what religion they wanted. In the Thirty Years War, was originally started as a religious war between Catholics and Protestants. Eventually, the war developed into a war between the Bourbons (French) vs. the Hapsburgs. The war ended with the Peace of Westphalia. The Peace of Westphalia led to the religious settlement of allowing the rulers of an area or state to decide their religion. Catholics and Protestants were finally the same under the law. The Netherlands negotiated with Spain and developed the peace treaty. Also, the Netherlands became an independent country. The three goals of the Congress of Vienna were 1. Balance of powers 2. Compensation for War loses 3. Legitamency of powers / monarchs. During the Congress of Vienna, Poland was a big topic. Russia wanted Poland, but Prussia did not want them to give Poland. They ended up splitting Poland up. The Concert of Europe was a type of congress system after the Congress of Vienna. The four major countries were Great Britain, Russia, Prussia, and Austria. France was included eventually into the concert. A robot was a labour rent. It was a type of feudal system that was eventually outlawed by Joseph II. The robot was a major division in land between peasants and nobels. In the Battle of Vienna, the Ottoman Empire had attacked the Holy Roman Empire. John Sobieski saved the day by leading his forces against the Ottomans. Because of Charles VI's lack of sons, the Pragmatic Sanction was issued and stated that the throne could be inherited by a daughter. This allowed for the Hapsburg dynasty to rule on. Maria Theresa developed the enlightened reforms in order to create a new importance of Austria. She reformed education, financial, and agriculture. Although, she did not allow religious toleration. In the War of Austrian Succession, there was a dispute if Maria Theresa was the right one to rule the throne of Austria. Even though her father issued the Pragmatic Sanction. Thus, there was a war between Prussia and France vs. Austria (Great Britain supported Maria). In the end, Silesia was won by Prussia and Maria Theresa took her rightful place in the throne of Austria. Joseph II's mother was Empress Maria Theresa. His enlightened reforms were abolishing punishments and death penalties, which led to equal treatment. Also, he abolished serfdom. Metternich was the 1st chancellor under the reigns of Francis I & Ferdinand I. The Metternich System was a congress where political and religious movements occurred. The Carlsbad Decrees were a set of restrictions of nationalist fraternities and constricted liberalism in the German Confederation. The Concert of Europe was a type of congress system after the Congress of Vienna. The two things that Metternich hates are the French Revolutionary ideas of quality and democratic government. In the 1848 Revolts the people wanted a liberal government (Magyars (Hungarians)), independence (Czechs (Bohemia)), more liberal government (Austria), and more independence (Italy). The government begins to become more liberal. Franz Joseph puts down the rebellion very violently. Frederick William I was called “The Soldier King” because he had an outstanding army. He developed having a mandatory military service in the middle class with an annual training. Frederick II developed enlightened reforms by having religious toleration, loved the arts, and modernized the Prussian service. Frederick II desired the land of Silesia, thus he did not follow the Pragmatic Sanction, which stated that Austria can be run by Maria Theresa. The War of Austrian Succession was fought between France and Prussia vs. Austria (Great Britain supported). Maria Theresa won by keeping her throne of Austria. But she did loose Silesia to Prussia. Johan Herder was a writer and apart of the enlightenment. Also, he was an early German Romantic. He showed this concept in supporting the Strum and Drang movement which was romantic movement towards German literature and music. He was significan because he approved the concept of nationality and of patriotism. But he did hate the absolutism and Prussian nationalism. He was German to the core, and very proud of it. George Friederick Hegel's theory on the progression of history was called a comprehensive philosophical framework or system. In the Frankfurt Assembly, they wanted a German Empire based on parliamentary democracy. They offered the crown to Prussian king Frederick Wilhelm IV, but he refused to accept it because it offered from the elected represenatives, or basically the people (or gutter) and not by the princes. Gross deutsch vs. kleine deutsch debate was a over how to unify Germany. In German, Gross deutsch and Kleine deutsch meand , Lesser Germany and Greater Germany. Both of the movements, were the growth of German nationalism. This partly failed because of the Austrian-Prussian War. Otto von Bismarck led the Prussian way to unite German, but wanted to destroy Austria at the same time. He successfully convinced the German states to join him, and the Protestant Prussia won and the lesser German solution was employed. The early renaissance began in Florence because the rich bankers paid for the best artists. There was a huge competition for the best art around. 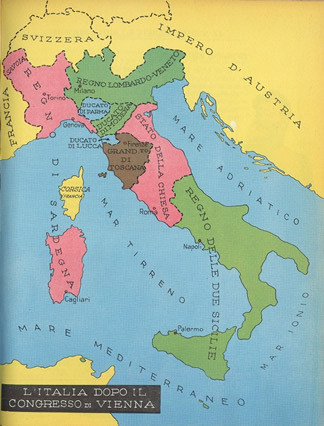 The Political organization of Italy was divided into small city-states. Rich families ran the city states. The Medici family ruled Florence. The family was powerful because they were bankers and could charge interest to make money. They also sponsored the painters, which increased the prestige of Florence. Cesare Borgia unified Italy. He was admired by Machiavelli because he wanted to unify Italy. Lorenzo de Medici ruled Florence during the High Renaissance. He supported many different artists. Friar Savonarola was against the Medici's. He kicked the Medici's out, and began to rule Florence. Then the people hated him, and killed him. The high Renaissance occurred in Rome. Also, the mark of the high Renaissance was caused by Charles V sacking Rome in 1527. Finally, Lorenzo de Medici's death was marking of the end of the Renaissance. Humanism was when scholars replaced spiritualism with human values. They are concern for the rediscovering the study of art, literature, and other aspects of ancient civilizations of Rome and Greece. Machiavelli's The Prince says his views on what a true ruler is. Such as, violence might be used as a necessary tool in order to remain a successful ruler. The ending of the Italian Renaissance occurred in Rome. The reason for the end was because of the French invasion. The Book of the Courtier shows that life was like in the Renaissance court life. Basically it showed what a true Renaissance man is. In Galileo's Dialogue Concerning the Two Chief World Systems, he says that the Earth and other planets rotated around the Sun. Basically, his views attacked the Pope, thus Galileo was charged with heresy and was sent on house arrest. Also, his book was put on the Index of Forbidden Books. In Cesare Beccaria's On Crime and Punishment, he argued against the types of torture and the death penalty. The three goals of the Congress of Vienna were 1. Balance of powers 2. Compensation for War loses 3. Legitamency of powers / monarchy. Italy was divided between Austria (north Italy), Hapsburg dynasties (Central Italy), the Pope (papal states), and Napoleon's Brother (Naples). Wanted to unify Italy. Young Italy, Neo-gulfs, and sardinians. Young Italy wanted democracy, Neo-gulfs wanted theocracy, and the Sardinians wanted a constitutional monarchy. The unification movements in 1848 were unsuccessful because the neighbors of Italy wanted them to unite, but the Italians were much weaker and did not agree. Giuseppe Mazzini was an Italian lawyer and his group was the Carbonari (liberal and patriotic ideas). He wanted to unify Italy as a whole. Also, he helped Europe form a democracy in a Republican state.